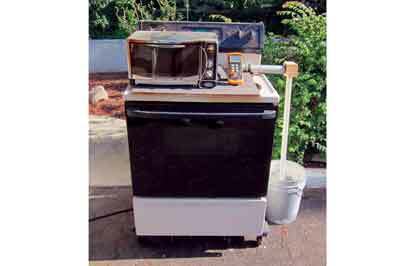 What happens if you combine woodturning with ceramic processing? A potter throws a pot, dries it, puts a glaze on it and then fires it at a high temperature. What I am talking about is turning an object from wood and then firing it in an oven. Because I am working with wood I won't be going to as high temperatures as potters do with clay, but a temperature of 200-250°C will change wood and yield an interesting new material that is no longer just wood. Heating wood to 200°C temperatures will darken it, and, in fact it will, serendipitously, enhance the chatoyance of the wood. People have studied wood for a long time and they have found that wood contains three materials: hemicellulose, cellulose and lignin. The amount varies with the wood species, but wood roughly contains one third of each. Of these materials, the hemicellulose is the most thermally unstable and is reported to decompose starting below 280°C. Cellulose decomposes next and lignin is the most thermally stable material, therefore, heating wood at lower temperatures will decompose mostly the hemicellulose. Hemicellulose is a polymer made up of various sugars that are joined together to form a giant molecule. Its decomposition can be compared with the process we are all familiar with when we caramelise the sugars in onions to make French onion soup. What are caramelised wood and charwood? They are woods that have been partially decomposed at temperatures above 200°C for caramelised wood and about 240°C for charwood. It involves a change of chemical composition and it is irreversible. These are materials that are on their way to becoming charcoal. The technical term for the process is called 'pyrolysis'. In general, pyrolysis of wood produces gases like hydrogen, methane, carbon monoxide and dioxide, and liquid products such as water, acetic acid and methanol, leaving a solid residue richer in carbon content, char. Extreme pyrolysis at very high temperatures leaves mostly carbon as the residue. 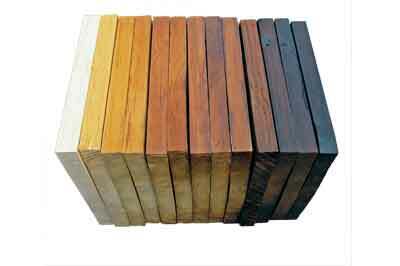 If you heat wood to less than 190°C, then you still have wood properties and no colour change. If you heat wood to 200-240°C and the colour darkens and the wood loses strength, this is what I call 'caramelised wood'. Heating wood to 260-300°C turns the wood black; it becomes very porous and loses weight and strength. At the lower end of this temperature range, you still have wood-like properties and therefore, I call it 'charwood'. At the higher temperatures you can produce charcoal. I find caramelised wood to be very fascinating. I can take a piece of cheap pine (Pinus spp.) 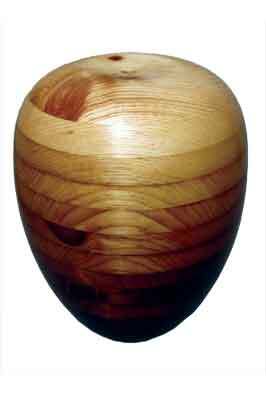 wood, turn a vessel from it, apply a finish and create an ordinary looking vessel with the expected look. However, I can make a similar vessel, made from the same wood and heat it in an oven to 200-230°C and recover a vessel that has lost weight and darkened in colour. The thing that adds interest is that I don't have complete control over the pyrolysis process, so some parts of the wood may darken more than others, leading to interesting results. After pyrolysis, the exciting part is opening the oven and discovering exactly what you produced. Did things turn out as expected? Are the colours right? Or was the temperature too low or too high? If I now apply a clear finish to the vessel, I get a piece with none, some, good or amazing chatoyance. Note: I am not creating the chatoyance; I am enhancing what is already present in the wood, but not readily seen. Therefore, not every piece will have great chatoyance, only those with the right structure in the wood. The chatoyance is hard to see in a still photograph, but it shows up well in a movie. If I heat the wood to higher temperatures, it turns black. This is what I call 'charwood'. At this point it still has the look and feel of wood, something like synthetic ebony. It has lost more weight than caramelised wood and is more porous, but can have good strength properties. The process I am discussing is the pyrolysis of wood or the anaerobic - without oxygen - decomposition of wood. The first question is how to exclude oxygen? There are several methods such as barriers, inert gases or oxygen getters. The simplest, cheapest and easiest method that I have found is to wrap the wood in several layers of aluminium foil. It may not be perfect, but it works well. At low temperatures - below 177°C - the main thing happening is the loss of water and a little decomposition and, therefore, the need for the exclusion of oxygen is probably not necessary. I get virtually identical results with or without a foil wrap at less than 190°C. I started with a toaster oven, bought cheaply from a charity shop, and later added an electric stove with oven so I could heat larger pieces. I was able to get a used oven that was cosmetically challenged for Â£60. I also bought a dual channel digital thermocouple thermometer - about Â£12 - so I could measure what the temperature actually was in the wood and ovens. The pipework on the right side of the large oven conveys hot gases and smoke from the oven vent into a water filled bucket, to reduce air pollution. The oven I have is a conventional oven without a fan. The temperature in the oven varies from the set temperature. 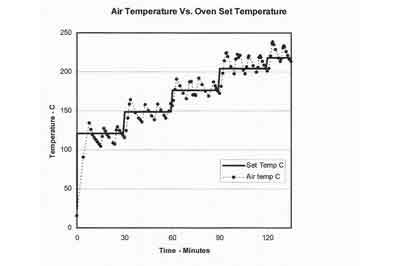 I have graphed the actual temperature inside my large oven as a function of time and compared it with the set temperature. Note the temperature goes 14-17°C above and about 8°C below the set temperature. Ovens with fans may do a little better, but to get good temperature control you will need to get an oven with a proportional controller. I had the idea to see what happens when you heat wood to higher-than-normal temperatures, but was unwilling to use 'good' wood. Therefore, I looked around and found some pine (Pinus spp.) and ash (Fraxinus excelsior) woods and used these in my initial experiments. Since I was planning on using the process ultimately on turned items, bowls etc, I started testing wood slabs cut to about 10mm thick, as that is a good wall thickness for many bowls. 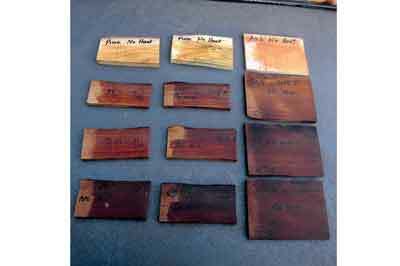 My first concern was whether I could produce pyrolysed wood without cracks. In my first experiment I heated the wood on the maximum temperature setting on my toaster oven and set the wood on fire. Wrapping the wood in foil helped, but at these high settings, the actual temperatures were probably higher. I saw flames coming from the foil and the result was black and broken charcoal. Therefore, I started experiments where I heated the wood to lower temperatures and started using longer heat-up times. This resulted in wood pieces with no cracks, less colour change and no fires. I did a series of tests where I heated some ash for two hours at several temperatures and measured the weight loss. 210°C lost 17%, 250°C lost 25% and 288°C lost 30%. The higher the temperature, the greater the degradation and this weight loss is permanent. After working with 10mm thick wood, I decided to try caramelising thicker wood and pyrolysed some 19mm-thick pine boards. I bought a 2.4m long board and cut it into 200mm square pieces and wrapped them in aluminium foil. Since these were thicker, the heating would be slower and pieces would be removed at several temperatures, so that woods could be obtained with different colours. The sample removed after heating at 190°C showed little colour change and the colours got darker as the temperature increased. All the pieces warped a little, none cracked. 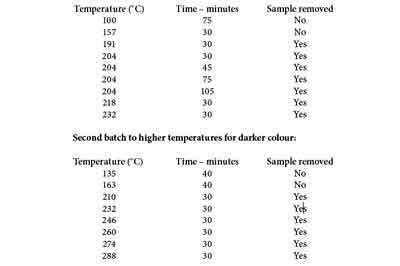 The samples removed at 274°C and 288°F were almost black in colour, very porous and had poor strength properties. 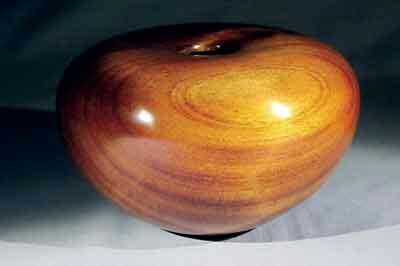 The boards were flattened and glued together and a hollow form was turned from it. The best chatoyance is seen in the wood heated to temperatures of 205-232°C. For this experiment I used a fir (Picea abies) at 50 x 100mm and also I turned two eggs - 50 x 63mm - from dry pine, wrapped them individually in foil and heated them at 120°C, 148°C and 176°C for 60 minutes at each temperature and then for 35 minutes at 232°C. All three pieces changed colour to a soft tan and did not crack. The photo shows the larger fir piece unfinished, while the other pieces have a clear epoxy finish. I turned a 100mm diameter solid wood sphere from dry pine, wrapped it in foil and heated it as follows: 120°C, 148°C, 176°C and 205°C for one hour each and for 30 minutes at 212°C. The sphere survived without cracking, but had little colour change. It was put back in the oven and heated at 176°C for one hour and at 232°C for two hours. This time the colour was darker and it also survived without cracking. It lost 10% weight and when finished, had some chatoyance, but was black over most of the surface. Caramelisation as I am doing it, is a bulk property. That is, the properties are changed completely through the thickness of the wood. Because of this we can choose to either final turn a piece and then caramelise it or rough turn, caramelise and then do the final turning. The photograph above shows a cutaway piece of pine, 50mm max. thickness, turned and caramelised, showing the uniform colour through the thickness. To understand the process of heating wood and how fast the temperature rises in the centre of a board, I did a series of tests using 25mm ash wood cubes. I drilled a small hole to the centre of each cube, so I could insert a thermocouple into the centre and measure the temperature. In the experiments I preheated the oven to the set temperature, 121-288°C, and then placed the cube, which was double wrapped in aluminium foil, into the hot oven and began to record the temperature vs time. The results are summarised in two ways: the maximum temperature reached and the time to reach 90% of the oven temperature. 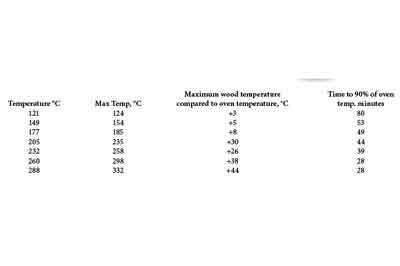 Looking at the column for 'maximum wood temperature compared to the oven temperature, it shows that at oven temperatures from 121-177°C the wood temperature was slightly above the oven temperature. This is the expected result for an inert material. While at oven temperatures from 205-288°C, the wood temperature exceeds the oven temperature by 30-44°C. This shows that the wood is decomposing and liberating heat, which raises the wood temperature. This is called an exothermic reaction. Note: the higher the oven temperature, the higher the maximum temperature. I also did one test using a 45mm diameter jacaranda (Dalbergia nigra) sphere heated in a 288°C oven and recorded a maximum temperature that was +267° above the oven temperature! This is an example of a runaway exothermic reaction and will occur with thick wood heated too rapidly. The second set of results on the time to reach 90% of the oven temperature is useful in determining how long it takes for a piece of wood to reach nearly uniform temperature. The results show that it takes longer times at lower temperatures. This is mainly due to moisture present in the wood, equilibrium moisture content, that must be evaporated and diffused out before the temperature can rise much above the boiling point of water. These wood cubes started at about 15% moisture content. 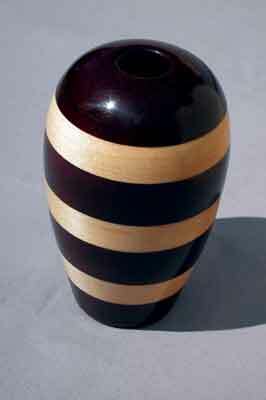 An example of variability is shown by two vessels turned from freshly cut jacaranda. The wood was a branch cut two days before turning. The wood was microwave dried to a weight loss of about 30% and then turned. Both vessels were caramelised in my large oven at the same time; however one turned dark, while the other had only a darker rim and a few darker areas. What was the difference? The vessel that turned darker was turned first and sat for a day and dried some more before it was caramelised. The second vessel was turned and caramelised within a few hours of turning and therefore contained more moisture. Both were 4mm thick at the rim, but the lighter vessel was thicker toward the bottom. The higher moisture content and greater thickness both prevented the lighter vessel from reaching as high a temperature and therefore, it caramelised less. I have read a report in the literature that stated the swelling and shrinkage of wood due to changes in humidity was mainly due to the presence of hemicellulose. Therefore, degrading it should reduce this sensitivity. 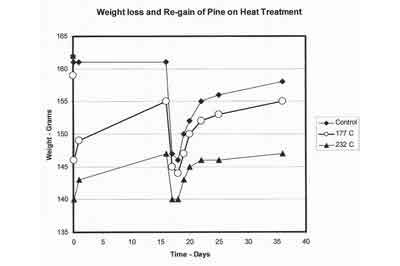 To determine if this is true, I did an experiment where I heated three pine pieces, cut from the same board, and measured the weight loss and re-gain as a function of heating temperature. 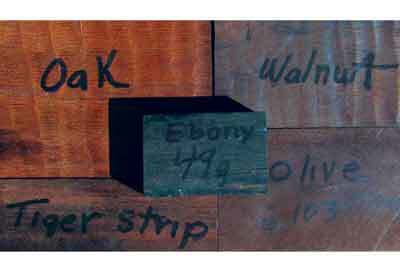 The pieces of wood were all the same size and weight, 19 x 90 x 240mm and about 160 grams. They were wrapped in foil and heated. One sample was a control and was not heated, while the others were placed in the oven and one removed after one hour at 176°C. The other sample was heated for one hour at 176°C, one hour at 205°C, and one hour at 232°C. The weight changes are shown in the graph. After 16 days, the samples, including the control, were placed unwrapped, in an oven set to 107°C to dry for six hours. The samples were removed and sat at room temperature and humidity to re-gain moisture. The graph shows that the wood heated at the higher temperatures lost more weight and was less sensitive to moisture loss and re-gain with time. This would be important in segmented vessels. Heating wood at high temperatures is a form of accelerated ageing. It will boil off any volatile materials in the wood, harden resins, speed the reaction of oxygen with any drying oils present and decompose some of the wood's hemicellulose. All these things lead to an increase in the stiffness of the wood and will change the acoustic properties. In an effort to see if I could detect such a change, I made three wooden hand bells, shown on the left, from the same log of juniper wood. Two of the bells were heat treated, one at 205°C and the other at 232°C. The colour turned dark brown as expected, with the bell treated at 232°C being darker. 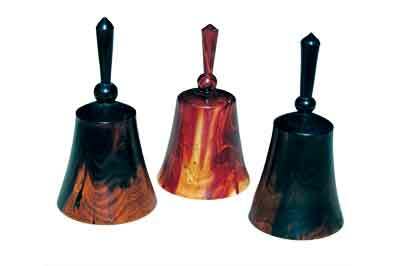 The bells were fitted with steel clappers and when rung, there is a difference in sound. Most of the pieces I have made are finished With a clear epoxy resin; however, I have tried several other finishes and all seem to work well. The only one that I had a problem with was Waterlox, which because of its darker colour, turned the piece darker than I would have liked. Linseed oil and tung oil were fine as was a water-based acrylic. 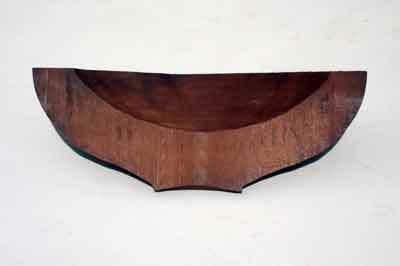 The caramelised pine bowl below shows great chatoyance. 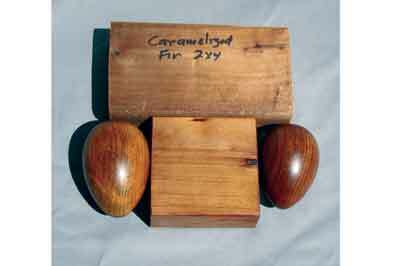 Before caramelisation it was 230mm in diameter, 63mm high and had a wall thickness of about 6mm and weighed 245g. It was wrapped with three layers of aluminium foil and was caramelised in my toaster oven using the following schedule: 149°C for 25 minutes, 177°C/55min, 205°C/20min and the maximum temperature setting for 20 minutes. After this heat cycle, it weighed 211g, had lost 13% weight and had a nice teak colour. It was coated with a light coating of thinned clear epoxy resin, which was totally absorbed. The next day it was re-coated with epoxy, cured and later polished. The final weight was 283g, so the bowl absorbed 72g epoxy or about 25%. The vessel on page 34 was rough turned and then sat for two weeks before final turning. It weighed 283g and was 150 x 95 x 6mm wall. It was wrapped with three layers of aluminium foil and caramelised in my toaster oven. Settings were as follows: 121°C/30min, 177°C/30min, 205°C/20min, and 212°C/10minutes. It had little colour change. The next day it was reheated using the following schedule: 177°C/30min, 205°C/30min, 212°C/20min, and then the max setting for 10 minutes. It now had a nice teak colour and weighed 253g, a 10% weight loss. It was coated with clear epoxy resin and cured, resulting in great chatoyance. Final weight was 320g of 67g weight gain of epoxy resin showing that the wood was very porous after caramelising. Heating wood at high temperatures also changes its appearance. 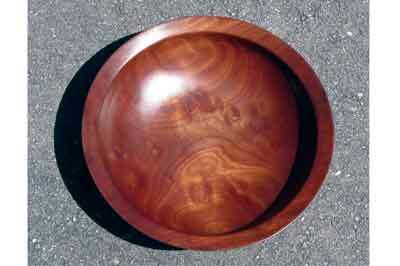 An example is a bowl I made from alder (Alnus glutinosa). The bowl, is seen to be a pale pinkish tan colour. After heating to 205°C the wood darkened noticeably and now looked like walnut (Juglans regia). 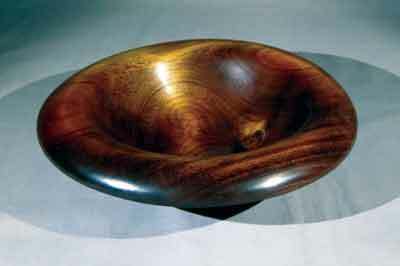 When finished with clear epoxy the bowl looks exactly like walnut. In addition, if you start with a dark coloured dense wood and heat it to 232°C you can make very good looking false ebony (Diospyros spp. ); however, it will probably have a lower density as shown in the following examples. My object here is not to fool people, but to provide a less expensive black wood. Samples of oak (Quercus robur), walnut, purpleheart (Peltogyne porphyrocardia), olive (Olea hochstetteri) and tiger stripe wood were heated in an oven at 121°C, 149°C, 177°C, 205°C and 232°C. The colour of the woods turned brown to black and lost 11-20% weight. The density before and after heating, weight loss and colour are shown in the following table. The density of ebony is 1.07g/cc in the sample I have. I have shown that heating woods to moderately high temperatures, 205-232°C, while wrapped in aluminium foil to exclude oxygen can lead to some interesting and exciting results. 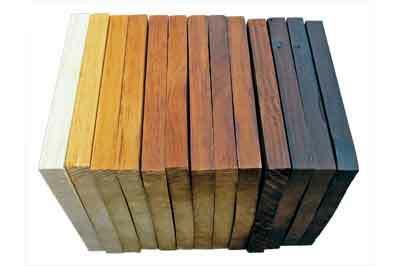 The various areas in the wood respond to these high temperatures in different ways that lead to increased contrast, and if the wood has the right structure, to increased chatoyance. There are lots of woods I have not worked with and would think will respond well to heating - figured maple comes to mind. 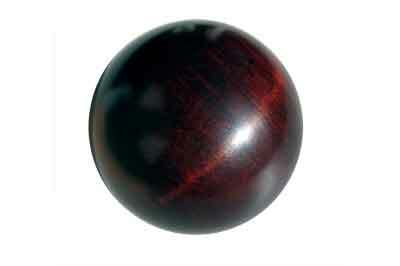 In addition, heating dense woods to 232°C can produce passable good false ebony. The whole area of heating wood for longer times, days to weeks, at lower temperatures, 121-190°C, needs exploration which I will leave to others.